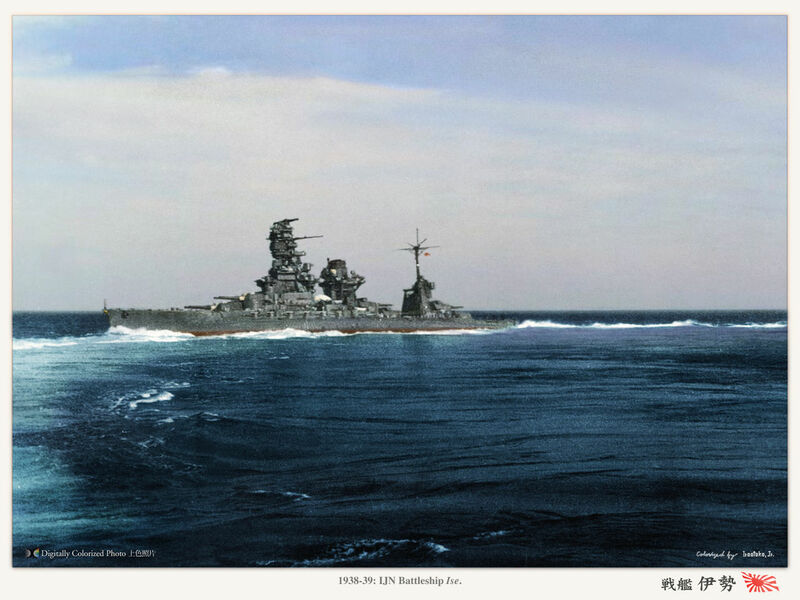 Ise and Hyūga were two fast dreadnoughts built by capitalizing from the experience gained with the two Fuso, the first battleships built and designed in Japan, although still with under strong influence of British engineering. They were launched in 1916 and 1917 and completed at the end of the First World War. To have the greatest firepower during the famous “barring the T” maneuver, the Admiralty wanted a concentrated firepower through twelve 356 mm main guns, making the choice of axial twin turrets. Apart their artillery on three twin superfiring turrets (whereas the Fuso had theirs each side of the funnel), their fire director was mounted on a solid tripod mast that will soon fill with secondary observation and servitude bridges in 1919-22. The idea of this superfiring pairs was to make the protection more compact, and therefore less heavy compared to the Fuso. 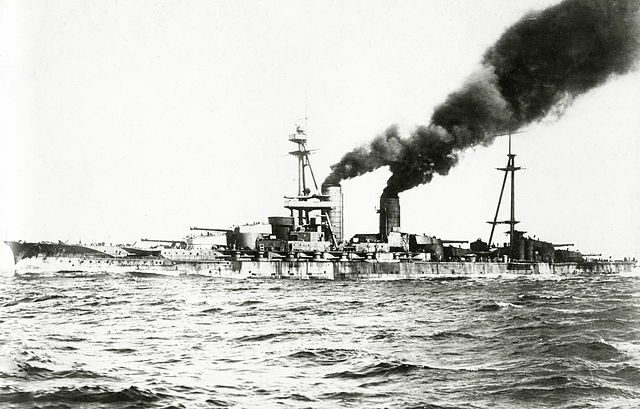 This allowed to reach in theory better speed as the hull length was about the same but the width was inferior, 31.75 m instead of 33 m.
Like the British HMS Agincourt initially ordered by Turkey, then bought by Brazil before being requisitioned, the Ise displayed a series of twin turrets, two of which were stacked behind the funnels in a superfiring pair, and the last two behind the rear blockhouse. 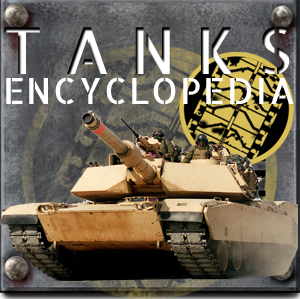 A configuration that, with the many openings made in the hull, weakened torsional structural strength, but offered a dispersion of targets for the enemy artillery. 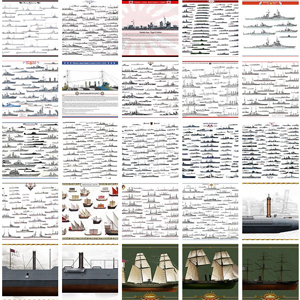 In light of this the choice of triple or even quadruple turrets as on American, Italian and French ships made sense. Their secondary artillery comprised 140 mm barbettes, comprising sixteen main guns. Light artillery was made of 75 mm quick-firing guns and submerged torpedo tubes completed this. The twelve 356 mm/45 (14.0 in) Type 41 guns were mounted in three pairs of superfiring turrets all along the hull. 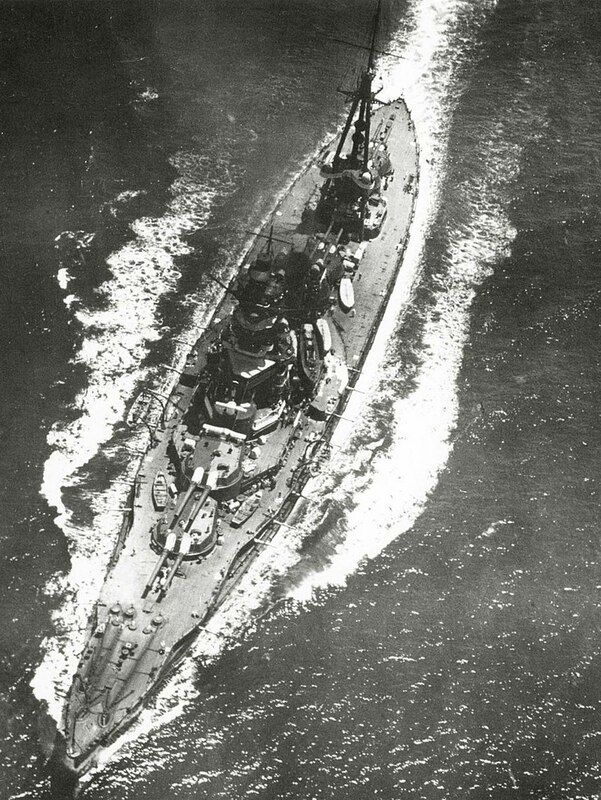 Each turret alone weighed as much as a submarine at 655 long tons (666 t), hydraulically powered. Their elevation was −5/+20 degrees and thanks to angled superstructures their traverse almost reach 300°. These guns were rated for 1.5–2 rpm and a loading system allowing any angle from −3 to +20°. The secondary artillery consisted of twenty 140 mm/40 (5.5 in) Type 3 guns of which all but two were mounted in casemates in the forecastle and superstructure. The remaining two were mounted on the deck above, under shields. In addition to their maximum elevation of 20° and 16,300 metres (17,800 yd) range, they could reach with a well-trained crew up to 10 rpm. The gunners trained to use the three settings available for range and speed of all targets, starting from 15,000 metres (16,000 yd) at 26 knots down to 7,000 metres, 37 knots. 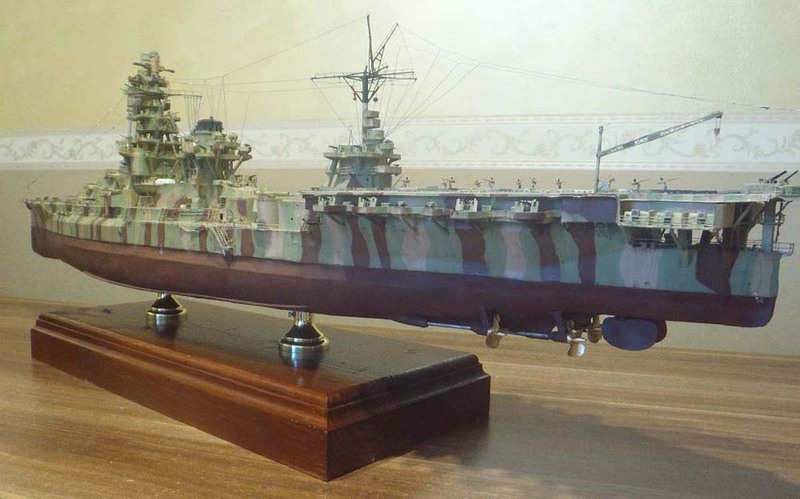 These models were also mounted on the battlehip Nagato. ONI recoignition plate, declassified public domain USN intelligence – Ise class. There was AA artillery provisioned in the design, in the shape of four 3rd Year Type 80mm/40 AA guns in single mounts. In addition there were 76,2 mm (3 in) dual-purpose guns with a +75° angle, 13-20 rpm, furing a 6 kg (13 lb) shell at 680 m/s (2,200 ft/s). Max. Ceiling was 7,500 m (24,600 ft). Also for very close quarters, six submerged 53.3-centimetre (21.0 in) TTs, three on each broadside were fitted, firing up to eighteen 6th Year Type torpedoes, each fitted with a 200-kilogram (440 lb) warhead. No computer was fitted at that time, data from the rangefinders was processed manually and the Turrets 2, 3, and 5 had their own 6-metre (19 ft 8 in) Bausch & Lomb rangefinders noted to be inferior by experts to the British Barr & Stroud models. 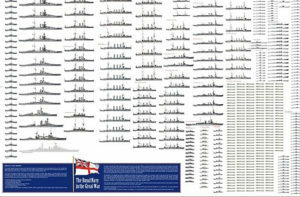 They IJN acknowledged this and they were removed in 1920, replaced by British models and 6-8 m (19 ft 8 in or 26 ft 3 in) local models. The Ise and Hyūga were propelled by two sets of direct-drive steam turbines, while their propeller shafts were 3.429-metre (11 ft 3 in) in diameter. High-pressure turbines drove the outer shafts and the low-pressure turbines the inner shafts (so four in all, two for cruise speed). In total 40,000 to 45,000 shaft horsepower (30,000 or 34,000 kW) could be generated, the Ise managing to generate the highest output of the two. The steam camed from 24 mixed Kampon Ro Gō water-tube boilers firing coal and oil. Their working pressure was about 13–16.9 kg/cm2 (1,275–1,657 kPa; 185–240 psi). 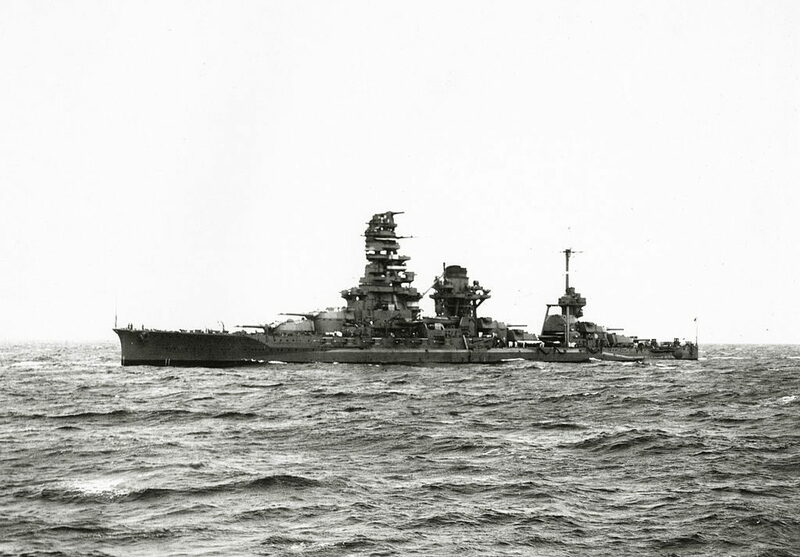 On trials they reached their design speed of 23 knots (43 km/h; 26 mph), Ise later hit 23.6 knots (43.7 km/h; 27.2 mph) from 56,498 shp (42,131 kW) on force heat, and Hyūga 24 knots (44 km/h; 28 mph) from 63,211 shp (47,136 kW). Stowage capacity was 4,607 long tons (4,681 t) of coal and 1,411 long tons (1,434 t) of fuel oil. Range was 9,680 nautical miles (17,930 km; 11,140 mi) at 14 knots. In addition, electrical power was bring by three 150 kilowatts (200 hp) generators and two 250-kilowatt (340 hp) turbo generators rated for 225 volts. Both had a waterline protective belt of 299 mm (11.8 in). It was made of Vickers cemented armour. There was however an underwater strake of 100 mm (3.9 in). The upper armoured deck was divided into two high-tensile steel plates 55 mm (2.2 in) in thickness. The the lower deck also had two layers, but of 30 mm (1.2 in). The box sides sloped downwards and the ends of the belt armour were enclosed by bulkheads 203 down to 102 mm (8 to 4 in) thick. Turrets frontal arc and sides were 254 mm (10 in) thick down to 76 mm on the roof. The casemate was 149 mm (5.9 in), and barbettes 299 mm. It was originally planned to make them 305 mm (12 in) thick. The conning tower walls were however of this planned thickness. The Ise introduced a ne safety measure as their powder magazines were placed above the shell store rather than the contrary, allowing more space to be placed between possible mine and torpedo detonations. 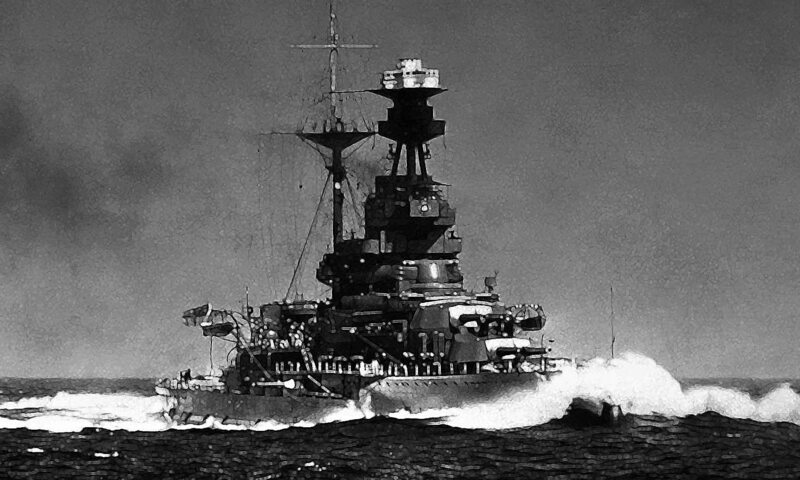 The danger of high-angle plunging shells were not considered since the 1916 Battle of Jutland did not happened yet. The depth of the double bottom was 3.58 metres (11 ft 9 in) below the barbettes and magazines to further dampen any explosion. Also the hull underwater was divided into no less than 660 watertight compartments. Ise was named after the traditional ancient Province of the same name. She emerged from Kawasaki Heavy Industries shipyard in Kobe, completed on 15 December 1917. 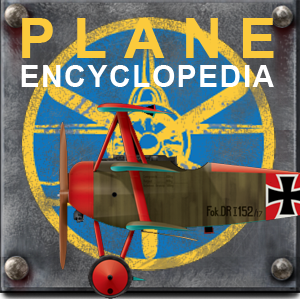 It was a bit late for service in World War I as most actions occured during the first year of the war, against the German pacific squadron. Ise was assigned to the 1st Division of the 1st Fleet until the end of the war. Her first captain Captain Kuwashima Shozo was replaced by Akizawa on 1 December 1918 and later by Captain Furukawa Hiroshi on 20 November 1919. From August 1920, she multiplied patrols off the Siberian coast in support of Japanese intervention against the Bolsheviks in this sector, and often overlooked chapter of history. Captain Yokoo Hisashi took command afterwards adnd was replaced in turn by Captain Nagasawa Naotaro by December 1921. 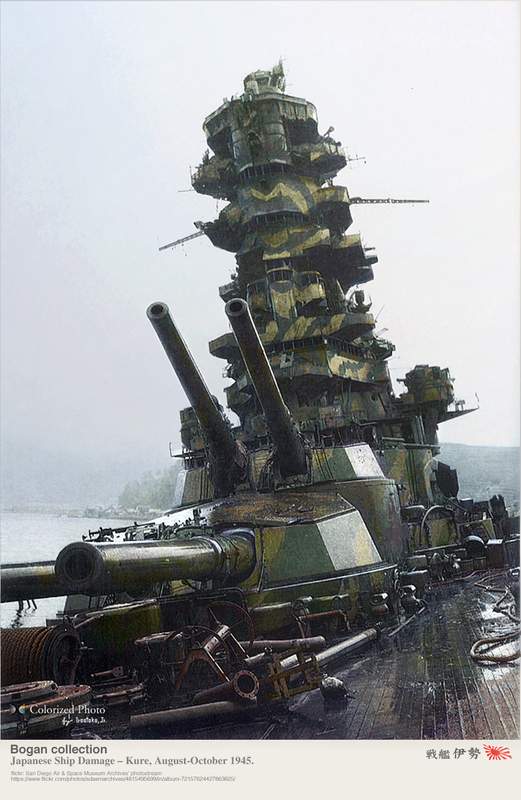 Hyūga on her part was also named after a traditional Japanese province and built at the Mitsubishi Heavy Industries shipyard in Nagasaki, completed on 30 April 1917, assigned to the 1st Battleship Division, 1st Fleet. Under her next captain, Kinzaburo Mimura, she suffered an accidental explosion in No. 3 gun turret, which killed 11 crewmen, wounding another 25 during an exercise on 24 October 1919. Under her next Captain Genjiro Katsuki she accidentally collided with and sank the schooner Hiromiya Maru on 21 July 1920 and from August with her sister-ship covered Siberian operations of the Japanese against the “reds”. Propulsion: 4 shafts Curtis or Parsons turbines, 24 Kampon boilers, 45,000 hp. 23 knots. Armament: 16 x 356 mm, 20 x 140 mm, 4 x 78 mm AA, 6 x 533 mm TT SM. On 12 April 1922 Ise hosted a delegation at Yokohama, the Prince of Wales (future King Edward VIII) and future Lord Mountbatten of Burma. 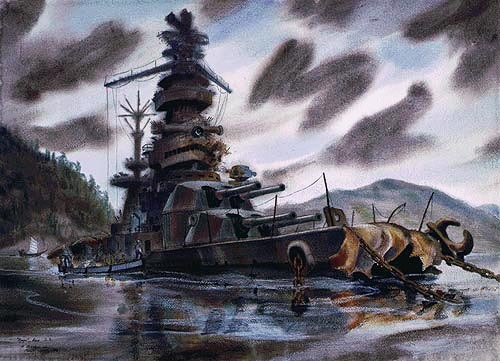 Under Captain Kanna Norikazu the battleship recused survivors of the Great Kantō earthquake in September 1923. 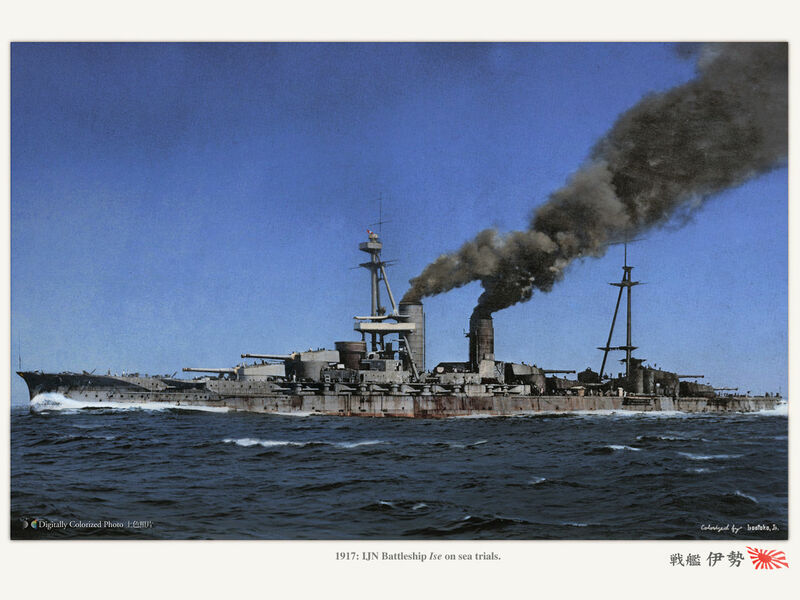 During her career until her second reconstruction, IJN Ise spent her time cruising off the coast of China, sinking the old destroyer Yayoi during a gunnery exercize in 1926. She was then taken in hands for a refit which lasted until 1928. She resumed her service and was taken in hands once more between 20 November 1931 and 10 February 1932 for another major refit. 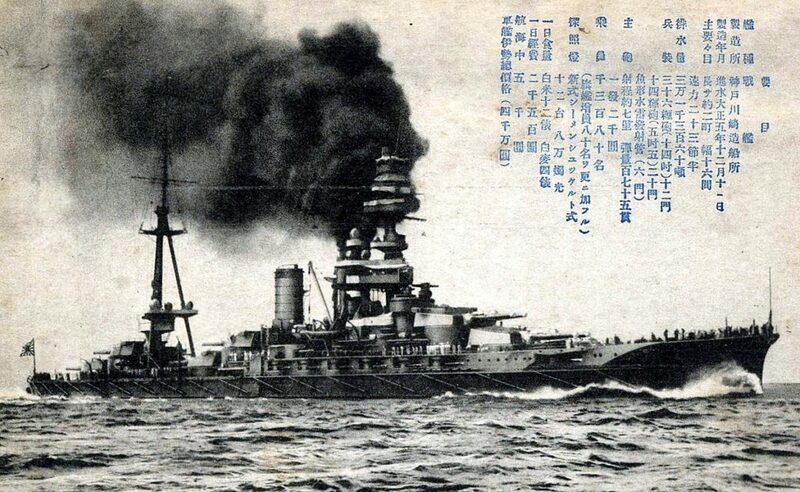 Hyūga on her side also aided survivors of the 1923 Great Kantō earthquake and regularly cruised off the coast of China. From 27 March 1932 after her first refit, she patrolled off the coast of China after the First Shanghai Incident. 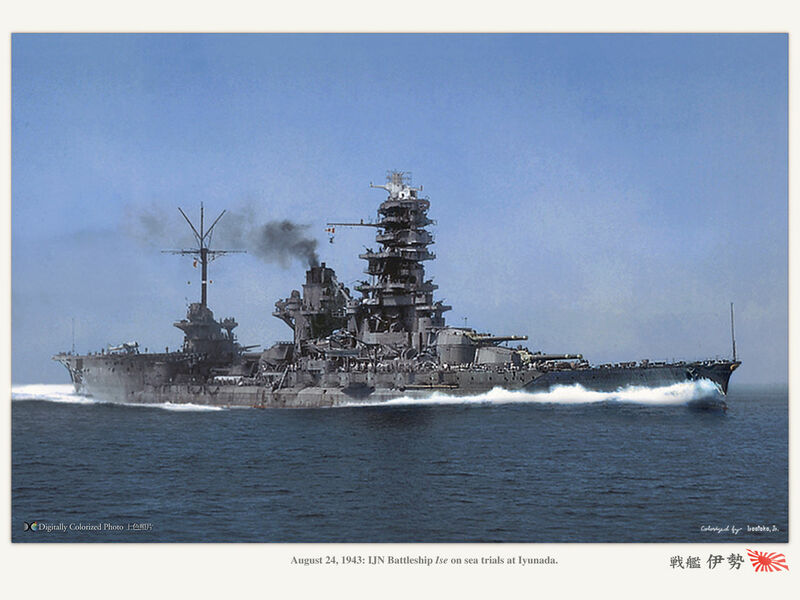 She sailed with Ise and the battlecruisers Kongo and Kirishima. During the Second Sino-Japanese War, she landed two battalions of the 3rd Sasebo Special Naval Landing Force to Port Arthur on 19 August 1937. She then patrolled the Chinese coast until early 1941 and from June 1940 became the flagship for the Emperor of Manchuoko Pu-yi, during his state visit to Japan. She was in the 2nd Battleship Division from September 1941. In 1926-28, these two ships were extensively modified, including a revamped gangway, enlarged superstructure, the addition of 127mm AA pieces and catapults for seaplanes on the front and rear turrets. In 1934-37, both vessels went into dry dock for further modernization work, this time radical. This redesign was complete, including an enlarged hull with anti-torpedo bulges, better compartmentalized internal protection and reinforced bridge protection against the air threat. AA weaponry was also revised upwards, with the adoption of multiple 25mm guns. Submarine torpedo tubes and some barbette pieces were sacrificed, especially at the rear. Their main artillery was also reworked, the mountings being modified to procure a greater angle, increasing their range. 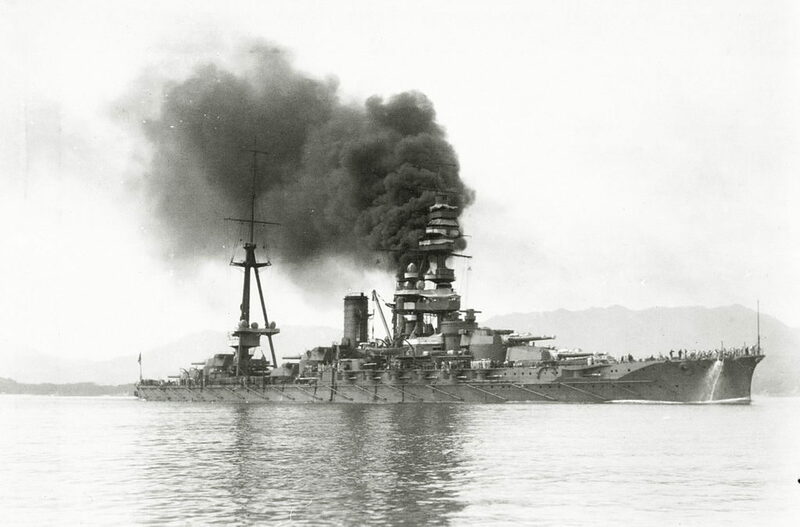 Their large tower superstructure, still supported by a tripod, was also new, and a distinctive trademark of IJN battleships. They were equipped with more modern rangefinders and powerful electro-optical instruments. Indeed, in the late 1920s all fire-control systems were upgraded. Additional platforms were added to the foremast for more. There were two directors for the 12.7 cm AA guns added in the early 1930s. Another upgrade was performed in the mid-1930s. New directors were added to serve the 25 mm AA guns. In the end, the last main 10-metre (32 ft 10 in) rangefinders were installed at the top of their pagoda mast for the main artillery. Type 21 air-search radars were also installed from mid-1942. At first, a Mitsubishi 1MF3 fighter type was launched from Turret No. 2 in 1927, replaced by a Turret No. 5 longer platform launching a Yokosuka E1Y reconnaissance floatplane the next year. but in the end a catapult was installed in the 1930s on the upper central turret (C), with three seaplanes in reserve. It was served by a collapsible 4-tonne (3.9-long-ton) crane on the stern. For these three floatplanes, no hangar was provided, and these Nakajima E4N2 biplane models were replaced by Nakajima E8N2 biplanes in 1938. The powerplant was modernized, losing two coal boilers, and resulting in single funnel supporting many bridges for AA and projectors. As a result, they gained speed, power and autonomy. The boilers indeed were replaced by eight brand new Kampon oil-fired onlt boilers. They all fit into the former aft boiler room. Therefore the forward funnel was removed. The turbines were also brand new, four geared Kampon turbines. Their designed output was 80,000 shp (60,000 kW) almost 1/3 additional power compared to their former output. This was to reach at least 24.5 knots (45.4 km/h; 28.2 mph) which were exceeded on trials, at 25.26 knots (46.78 km/h; 29.07 mph) obtained from an output of 81,050 shp (60,440 kW). Fuel storage was augmented thanks to its less expansive volume up to 5,113 long tons (5,195 t). However range fell to 7,870 nautical miles (14,580 km; 9,060 mi) – rather than 9500, but at 16 knots. 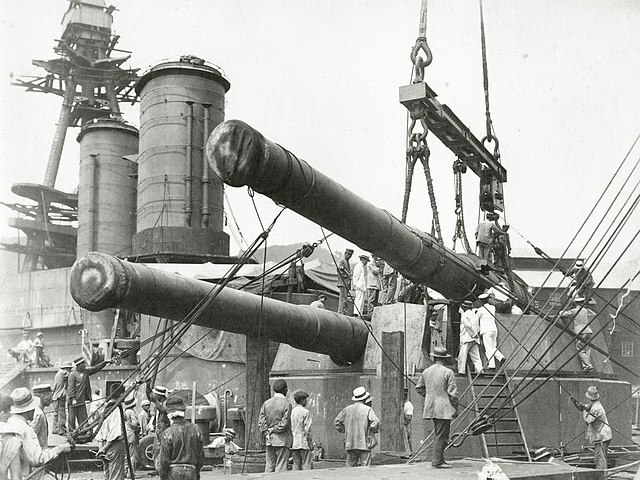 In 1921, elevation for the main guns was increased to +30 degrees in the first step. In the 1930s this was further icreased up to 43 degrees for all turrets but turret No. 6 : Its supporting structure could not be lowered. The recoil mechanism was also modernized, using a new pneumatic system allowed for a faster firing cycle. Meanwhile their main guns received storages of the new Type 91 armour-piercing, capped shells. Each weighed 673.5 kilograms, reaching a muzzle velocity of 770–775 metres mps with a range of 25,000 metres (27,000 yd) but by the time of the interwar modernization, it reached 35,450 meters (38,770 yd) at +43°. HE 625-kilogram (1,378 lb) shells were also carried, with a muzzle velocity of 805 mps, and in limited supply, a special Type 3 Sanshikidan incendiary shrapnel shell for anti-aircraft use was also introduced during the interwar refit. Also in the 1931–1933 modernization, AA guns were replaced by new 127 mm/40 (5.0 in) Type 89 DP guns. They landed each side of the forward superstructure, four twin-gun mounts in all. Their surface range was 14,700 metres (16,100 yd) and AA ceiling was 9,440 m (30,970 ft) at 90°. Rate of fire was 14 rpm, and in sustained fire eight rpm. Also a licence was acquired for the famous British 2-pdr Vickers, and two twin mounts light AA guns were added, which had a 80° angle and could fire at 200 rrpm. To make room for these, the old secondary 140 mm guns of the upper deck were removed. Torpedo bulges and torpedo bulkheads were added during the modernization, and the protective deck armour over the machinery and magazines reached 140 mm. The turret roofs also rose from 75 mm to 152 mm because of the aerial threat. It was in 1933 that she was given this characteristic pagoda mast, her stern was modified, and a catapult and crane fitted at Kure Naval Arsenal. But despite of these modernization to extend her active life, from 15 November onwards, she became a training ship, participating in the state funeral of Marshal-Admiral Marquis Tōgō Heihachirō (the hero of the Battle of Tsushima, on 15 June 1934). She was drydocked once more in 1935 at Kure Naval Arsenal and her last reconstruction lasted until 23 March 1937. So she resumed her career on 9 April 1938, again on the southern Chinese coast, this time taking an active part in the during the Second Sino-Japanese, until early 1941. She was then transferred to the 2nd Division, 1st Fleet after the arrival of the Yamato from 15 November 1940. She was the flagship of the 2nd dividion on 15 November 1941 under Captain Takeda Isamu. Protection: Belt 300 mm, turrets 300 mm, ammunition stores 200 mm, citadel 350 mm. Armement: 12 x 356 mm (6×2), 16 x 140 mm barbettes, 8 x 127 mm AA, 20 x 25 mm Type 96 AA, 3 Nakajima Floatplanes. 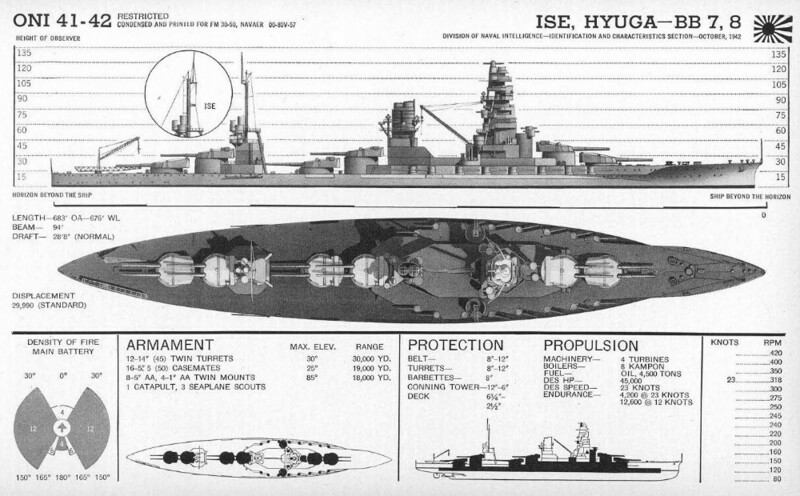 When the Second World War came, Ise and Hyūga were involved in combat maneuvers, in comparison with the rest of the naval group. Their first assignment was the cover of the Pearl Harbor attack. But because of their speed of 25 knots, they were considered obsolete like the Fuso class, quickly relegated to the second rank battle divisions. 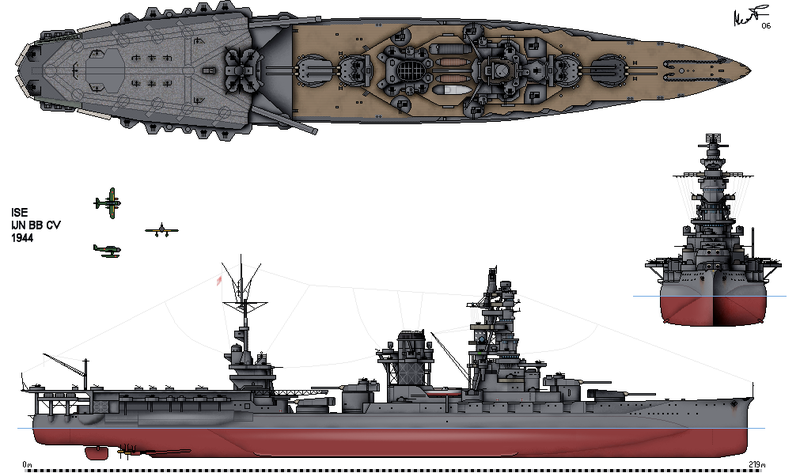 After the Battle of Midway, it became important to the IJN to keep and edge on new air platforms, and these two ships, which were a little faster than the Fuso, were therefore chosen for conversion. 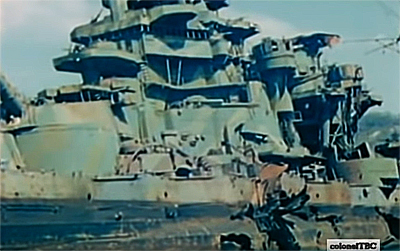 They emerged at the end of 1943 with a flight deck at the rear (their two extreme turrets are removed and recycled for coastal defense), with a central hangar served with elevator, catapults, and a complement of 14 Yokosuka D4Y catapulted torpedo bombers and 8 observation Aichi E16A, also floatplanes. 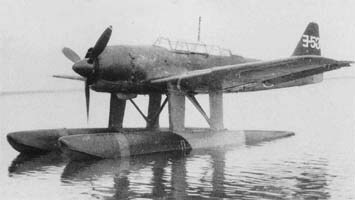 They also tested various aircraft such as the A6M2-N fighters (seaplane version of the famous Zero). Their AA light artillery was further enhanced. Aichi E16A “Paul” carried on the Ise. This was a 1944 two-seat reconnaissance seaplane capable of a 2,420 km (1,307 nmi, 1,510 mi) range. It was given a Mitsubishi Kinsei 54 14-cyl. air-cooled, twin-row radial engine of 1,300 hp (970 kw), enough to reach 439 km/h, was armed by two 20 mm wing guns and one defensive 13 mm (.51 in) Type 2 HMG, and it could carry 250 kgs of bombs. More precisely the planes carried were the D4Y1 KAI Suisei Model 21, and D4Y2a KAI Suisei Model 22/22A modified to be catapulted. They were supplied by the 634th Kōkūtai. These were not floatplanes and recovery was therefore apparently impossible. It was a one-way ticket mission, just like British CAM-ships. These were special versions to be catapulted, possibly with their train apparatus removed or welded shut. The D4Y1 and 2 were fast but lacked armor and self-sealing fuel tanks, they shared the same 895 kW (1,200 hp) Aichi AE1A Atsuta 12 engine characterized by a ventral air intake. They participated in numerous exercises in the Second Battleships Division, until a last-ditch large-scale operation, at the Battle of Leyte. They were part of Admiral Ozawa’s “bait fleet”, intended to attract the fleet to the north (which it succeeded to do), attracting Admiral “Bull” Halsey out of its protection area of TF38, then covering landing operations. 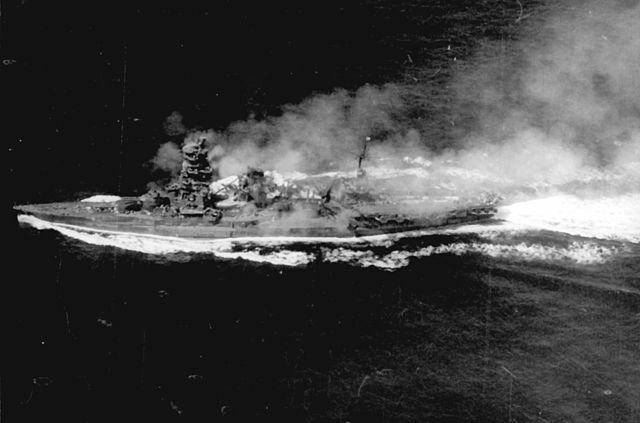 The bait fleet was eventually reached by naval aviation and after more than five American air raids lasting for several days, the two battleships were left virtually the only survivors of the Ozawa fleet, retreating to Kure until the end of the war. Sunk by an air raid on the 24th and 28th July 1945, at Kure Harbor, they were captured by US Occupation forces, abundantly filmed and shot, and later raised for demolition in 1947. Footage of the Ise in 1945, just captured by US Forces. > For scratchers: Further references on artstation.com. 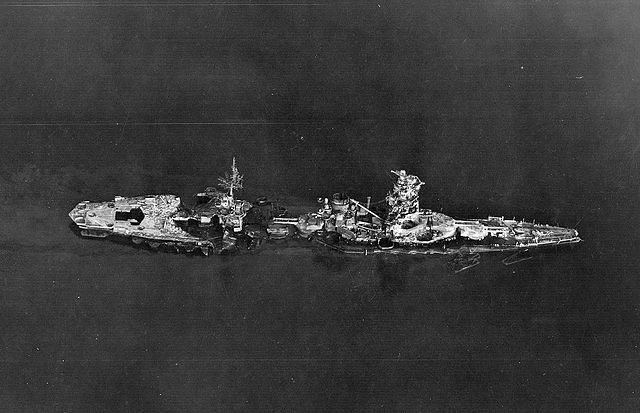 The controversial photo showing the Kure IJN Ise 1945 camo pattern, after being sunk. It shows two tones, not three, and the light olive is a possible interpretation. A capture of the footage above, showing perhaps best the odd Japanese camouflage, a combination of greens as it seems, in two tones. But it has been reconstructed as a bit more complicated (and still highly conjectural! ): Olive dress broken up with patches of gray, red-brown, yellow, and even dark green. In comparison, Haruna was Olive green overall with her turrets painted light green with gray stripes. 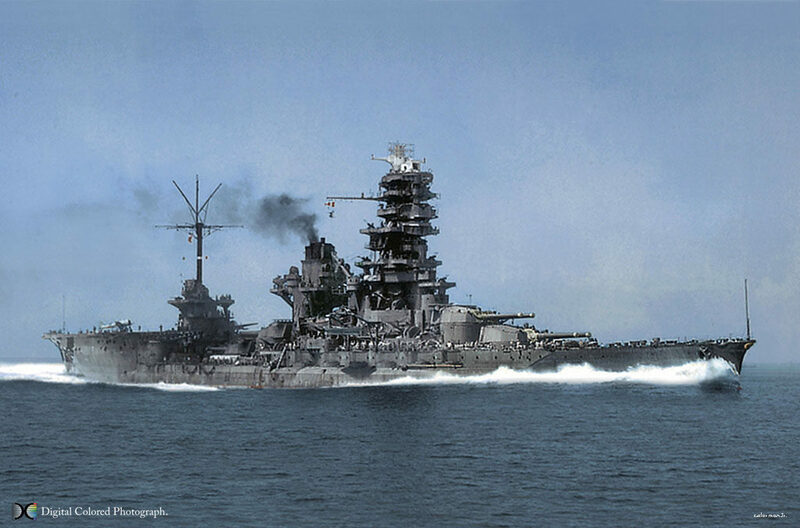 Hyūga was more reasonable it seems, with dark green curved painted on the turret, on the original dark grey overall.